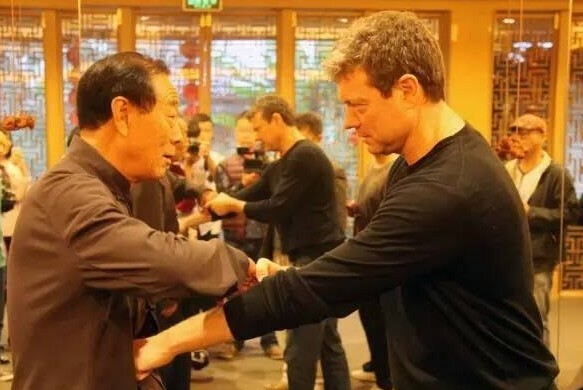 Bourne director travels to China to find out more about Bruce Lee and the Taiji Connection! 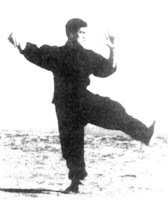 I came across an interesting article on China’s “World Taijiquan” website a couple of months ago that discussed a set of photos taken at Long Beach, California in 1964 showing Bruce Lee training Taijiquan. Famous for films such as Enter the Dragon, Fists of Fury and The Big Boss, the article asked why it was that while everyone knew about the influence of Wing Chun master Ip Man on Lee’s martial arts, the importance of Taijiquan on his development had been so overlooked. 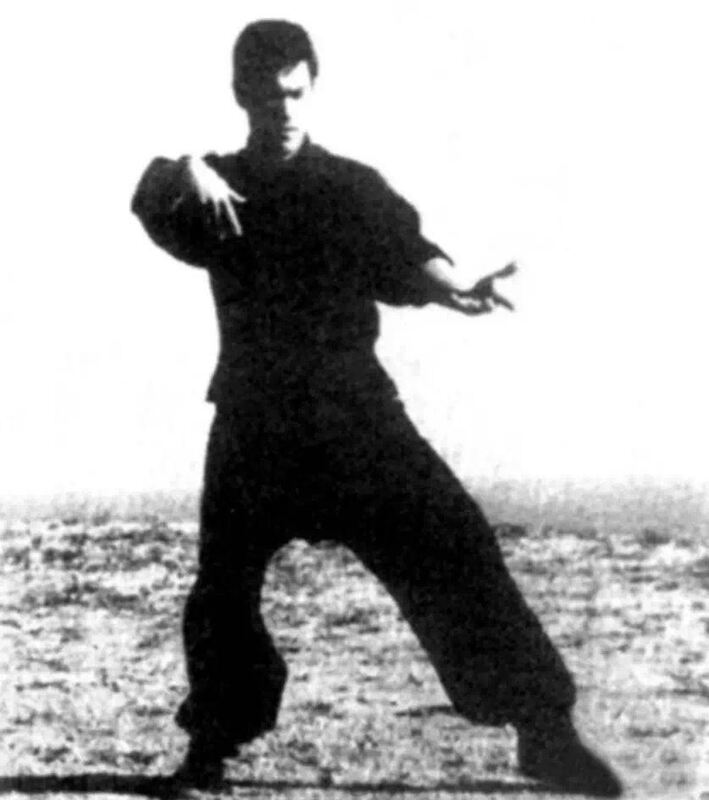 Lee’s earliest introduction to Chinese martial arts was through Taijiquan, his first teacher being his father Li Haiquan. Lee senior was a famous Cantonese opera artist who had studied Taijiquan for many decades and by all accounts had a decent level of skill. The general narrative goes that Lee junior stopped doing Taijiquan when he was twelve or thirteen years old and moved on to other things. The article on the other hand stated that “Li Xiaolong (Bruce Lee) studied from his father from a young age, and without break for the next twenty years”…and that “Taijiquan’s gongfu and philosophy played a huge part in his martial arts development”. At the time these photos were taken Lee would have been somewhere in his twenties. Some forty years after his death, it seems that the role of Taijiquan in Lee’s formative years is about to get the full Hollywood treatment. An intriguing piece of news just released on China’s Qiling Film Industry’s website Entertainment News links famous Hollywood director George Nolfi, Chen Taijiquan grandmaster Wang Xian and the little dragon himself, Bruce Lee! 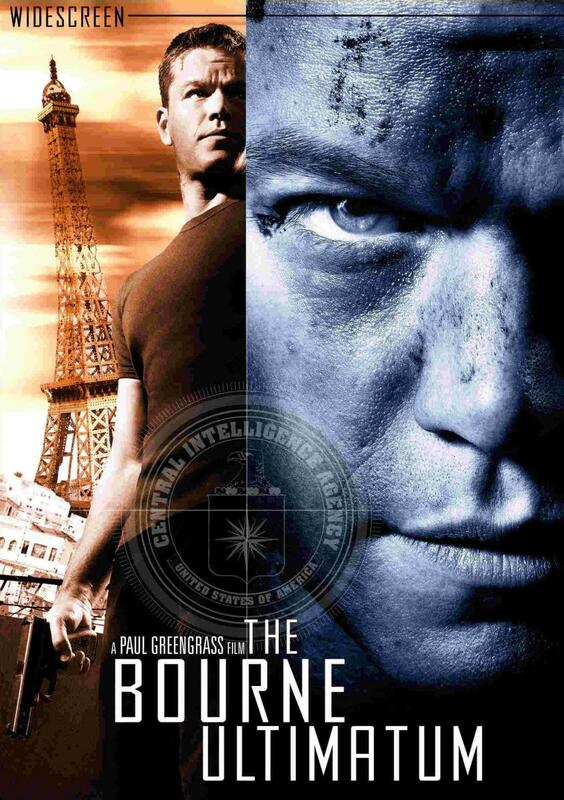 Nolfi is director of blockbuster movies including The Bourne Ultimatum, The Adjustment Bureau, Ocean’s Twelve and The Sentinel. 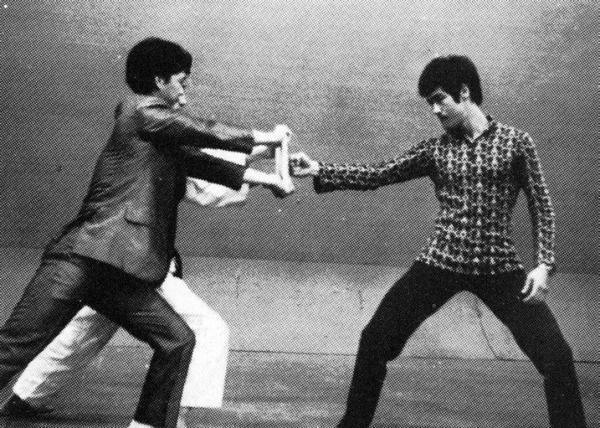 His latest film project titled Birth of the Dragon tells the story of Bruce Lee’s rise to international superstardom. While researching the movie Nolfi, was intrigued at how Taiji principles seemed to underpin much of the philosophy within Lee’s own Jeet Kune Do system. 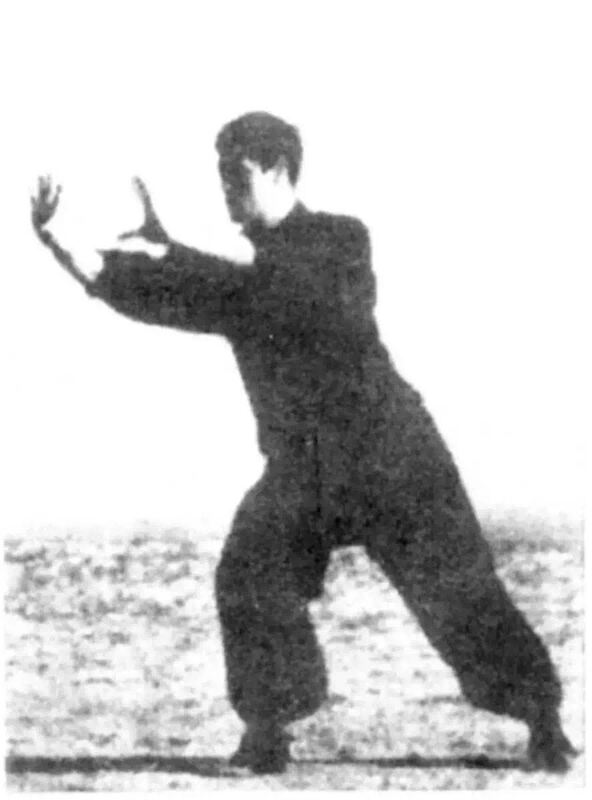 In the eyes of the American movie maker Taijiquan was a soft dance-like exercise of little practical use as a fighting art, yet Lee repeatedly exhorted and promoted the principles of Taiji through concepts such as “using stillness to overcome movement”, “the coexistence of hard and soft” and “the cultivation of internal as well as external”… Nolfi puzzled over this link to Taiji which, to his way of thinking, seemed completely at odds with the dynamic portrayal of Lee on the silver screen. 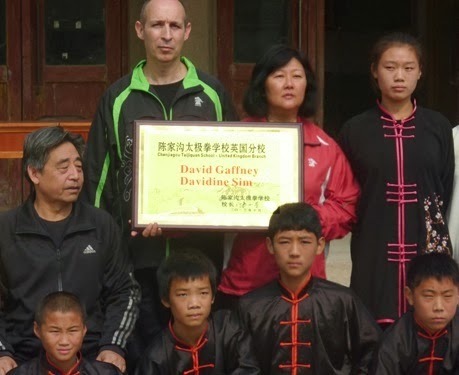 To satisfy his curiosity he decided to do some firsthand research into Taijiquan in China. 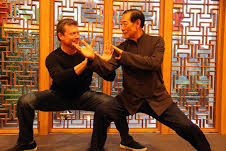 Entertainment News reported: “On 29th Oct in preparation for the upcoming American-China collaboration, Birth of the Dragon, Hollywood director George Nolfi flew into Shanghai and accompanied by the CEO of the Qilin Film Industry travelled to Hangzhou to visit 19th generation Chen style Taijiquan inheritor Wang Xian in order to fully understand the essence of Taijiquan culture in preparation for the film”. The report went on to say that Nolfi came to China with lots of questions about Taijiquan. He was introduced to Wang Xian by billionaire entrepreneur Jack Ma of Alibaba.com and kung fu stars Jet Li and Wu Jing all of whom are disciples of Grandmaster Wang. 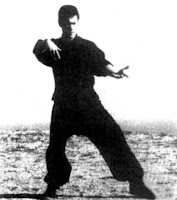 Without further ado Nolfi was shown the effectiveness of traditional Chen Taijiquan. 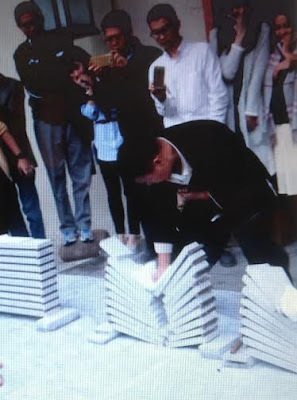 First up Wang Xian’s disciple Wang JIngchen demonstrated Taijiquan’s short power or cun jin by smashing a pile of tiles. Cun jin can be translated literally as “inch power” - it might surprise filmgoers familiar with Lee’s “one inch punch” to know that this has been trained in Chen Taijiquan for centuries now. 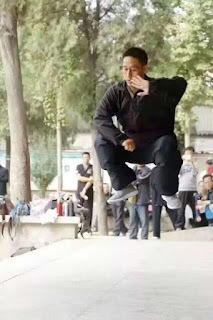 Nolfi expressed surprise that Taijiquan could generate force like this. Next up he asked if he could try a little with Wang Xian. Making contact with the seventy year old Wang, Nolfi was instantly tossed to the floor. Afterwards he was reported to have said that it is the first time he has experienced what Taijiquan gongfu is and he wants to put it on the screen. It’s even been whispered that Wang Xian might play a cameo in the film! 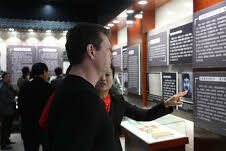 Carrying on his desire to understand Taijiquan’s roots and place in the pantheon of Chinese martial arts, Nolfi visited Chenjiagou, where he was given a tour of the Chen Family Temple and the Chenjiagou Taijiquan Museum and watched demonstrations of Chen Taijiquan forms. And the final word to Nolfi – “Through the ages Bruce Lee is the most famous representative of the Chinese people. In the West he is not just the first person to popularise Chinese Kung Fu, but so many years after his death interest in him has not diminished. This time coming to China I want to more closely understand Chinese culture, Chinese martial arts and also the background of Bruce Lee’s life”. I'm writing this blog post in transit from Chenjiagou to Borneo via Shanghai. During the flights and the down time in between I had a chance to reflect on an eventful and thought-provoking visit to China. I won't apologise for rambling on a bit, but this trip brought back many memories as the confluence of several large events in the village saw us meeting lots of old friends from the past. The first few days in Chenjiagou were quiet. Training with Chen Xiaoxing in the small room he likes to use just a few doors away from his living quarters. Every morning at about 8am he leaves his room and walks the few metres to the training room. This is an unchanging routine and it is expected that those who are training with him will have begun standing before he arrives. After adjusting each student's posture he leaves everyone to try to maintain the position and feeling for another 30 or 40 minutes. This is followed by a short break and then half an hour or so doing a single reeling silk exercise. Another short break to ease the legs and then everyone trains individually on whatever it was they are working on while the teacher wanders about informally correcting any mistakes he sees. The kind of person who needs to be entertained and spoon fed does not tend to enjoy or last long with this kind of training. Quickly people began to arrive from all over China for the main purpose of our visit, Chen Xiaoxing's six day training course for the branch instructors of the Chenjiagou Taijiquan School. The course was intended as an opportunity to meet and upgrade their standard together. Chen Ziqiang addressed the group during a meeting one evening saying that while the school has branches all over China as well as a number of international branches, it is not often that they can come together to share expertise and support each other. He spoke animatedly about the importance of coaches of the school knowing the history and theory of their system and not just repeat what they hear someone else say. As part of the coaches education programme certain language needed to be standardised to avoid confusion. For example the confusion between whether to refer to the current generation as eleventh (tracing back to Chen Wangting) or nineteenth (tracing back to Chen Bu) generation. Chen Ziqiang said that within the Chenjiagou Taijiquan School his father's generation are nineteenth generation and his students twentieth. 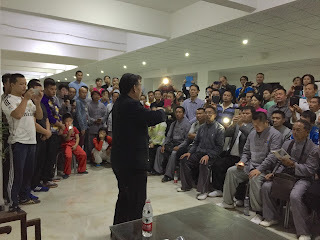 On another evening Chen Xiaowang took time away from his own event to talk to the group for an hour or so about the principles of Taijiquan and how to apply them in your practice. The main aspect covered during the course was the Xinjia Erlu or New Frame Second Routine, the dynamic form created by Chen Fake, with additional sessions on the fundamentals - zhan zhuang and chansigong. At the beginning of each session Chen Xiaoxing would climb onto the stage in the front of the main training hall and demonstrate a short series of movements, explain the finer details, and then go through each move slowly and then explosively as they're supposed to be done in the second form. that the instructor seemed agitated each time his posture was being adjusted. On asking what the matter was, he got the whispered reply, "would it be ok to correct me afterwards?" Chen Xiaoxing said that this kind of ego makes him angry and that he never again treated the instructor as a serious person worth teaching. Chen Xiaoxing can be very humorous. One student asked earnestly how you could tell if your buttocks were sticking out too much? His tongue-in-cheek answer was - "if your trousers fit comfortably when you're standing up, but you feel them stretching as you turn your hand (he was referring to the single hand front reeling silk exercise), then your buttocks are sticking out too much". In between teaching Chen Xiaoxing would often bark at the constant stream of tourists wandering into the training room, shouting at them to get out of the room if they were not supposed to be there. But, as anyone who has trained in Chenjiagou knows, some of these guys are really thick skinned and within a few minutes they would try to sneak back in. can be seen externally then it is too much. He advised everyone to follow their own body condition. He gave the example of someone with a curvature of the spine. Trying to straighten the spine cannot bring a good result, rather the person must use feeling and sensation to reach the optimum place for themselves. 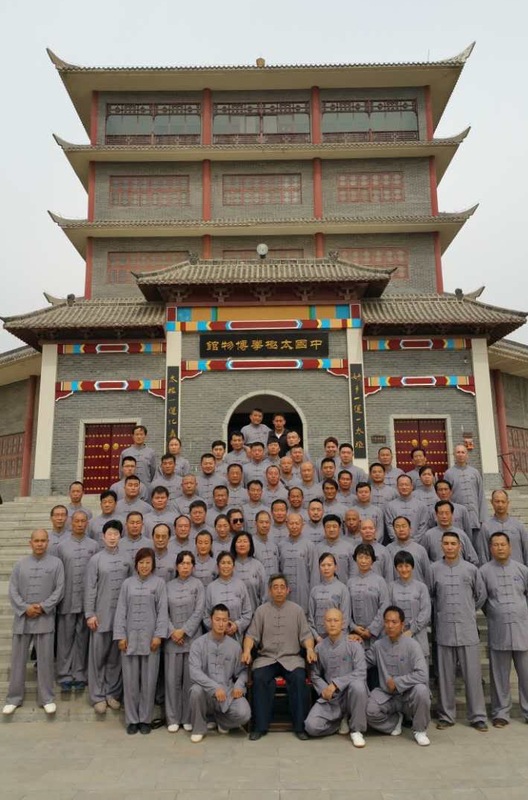 Chen Xiaowang's 70th birthday celebrations took place over three days at the same time as Chen Xiaoxing's training camp. We only managed to attend his birthday banquet held one afternoon in a plush hotel in Wenxian. After the morning session was over we joined Chen Ziqiang and his father to travel the short distance to Wenxian to join the festivities just as they were starting. On the head table with Chen Xiaowang were representatives from the other four main Taijiquan styles. A sea of tables filled a vast room and I heard one guy estimating that there were close to 1,000 people attending. It was great to meet up with Taiji friends we've not seen for some time. Especially a big shout out to Singapore-based Chen Taijiquan veteran Foo Shang Wee who we first met back in 2000 when we trained with Zhu Tiancai in the Lion city. Foo took us around the city and photocopied and bound some of his large collection of Taijiquan articles and notes which were invaluable when we wrote our first book. During the bash we shared an interesting table with Chen Jingyuan the Chenjiagou Village Head, Chen Bing, Zhao Zhifang who we first encountered at Chen Zhenglei's First International Taijiquan Training Camp in Handan, Hebei province way back in 1999. How time flies, he was an exuberant young instructor then and was in Chenjiagou ready for Chen Zhenglei's large camp that started during the last few days of our stay. Zhao was accompanied by his wife and children. His wife is an old friend of ours who happens to be a disciple of Chen Xiaoxing. So their's must be an interesting household when talking Taijiquan! The village continues to grow year by year bearing little resemblance to the place I first visited almost two decades ago. This time we stayed at Chen Ziqiang's new training centre five minutes walk from the main school. The centre is seven stories high with the fifth and sixth floors serving as training areas, four floors of modern accommodation and a viewing platform on the top floor from which you can see the the extent of the changes. Eventually he plans to add another two stories. On the penultimate night of the camp a stage was erected in the Main Street in front of the school for a series of demonstrations and fun auctions to raise money for the needy of the village. Before proceedings got underway an old character from the village got up on the stage and in a powerful voice told all the people who were sitting on the seats reserved for the performers to get up, shouting, "if you're impersonating a famous person, stop it"! There were many demonstrations of hand and weapon routines, groups and individuals including a powerful young man doing the swordform who turned out to be Chen Shitong's grandson. The last Taijiquan performance of the evening was by Chen Xiaoxing. With the time getting late he did a short section of the New Frame First Form before casually leaving the stage. The show was closed by two young women doing a Chinese version of the can-can. What this had to do with the rest of the evenings entertainment I have no idea, but hey this is China.